When taking a child to the dentist for the first time, parents should follow the "rules of ones." Children should see the dentist by the time they get their first tooth or reach their first birthday, and then continue with regular dental visits every six months -- just like their parents! With a majority of families not taking their children to the dentist until the age of 3, you'll already be ahead of the game. Introducing professional dental care into your children's lives early is a great way for parents to stay on top of their dental health. 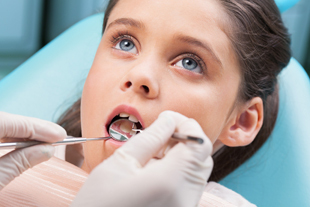 Properly preparing children for the dentist will help guarantee a successful visit. When talking to your child about his or her first dental visit, be careful how you phrase your discussion. Avoid using negative words that might create unnecessary dental anxiety, such as hurt, needles or drill. Instead, speak in general terms and remain positive -- after all, visiting the dentist keeps you feeling great, so why wouldn't you want to go? It's also important to lead by example -- when children see you visiting the dentist every six months, they'll be more likely to follow your lead.